We are pleased to announce the introduction of the Corvara cabin to our existing range of 44mm cabins. Based on the proven design by Eurovudas, the Corvara cabins feature a set of double doors, fully glazed, to the front wall along with a tall, opening window. On one side there are additional window(s) Depending on the size selected, you will either get one side window or two. 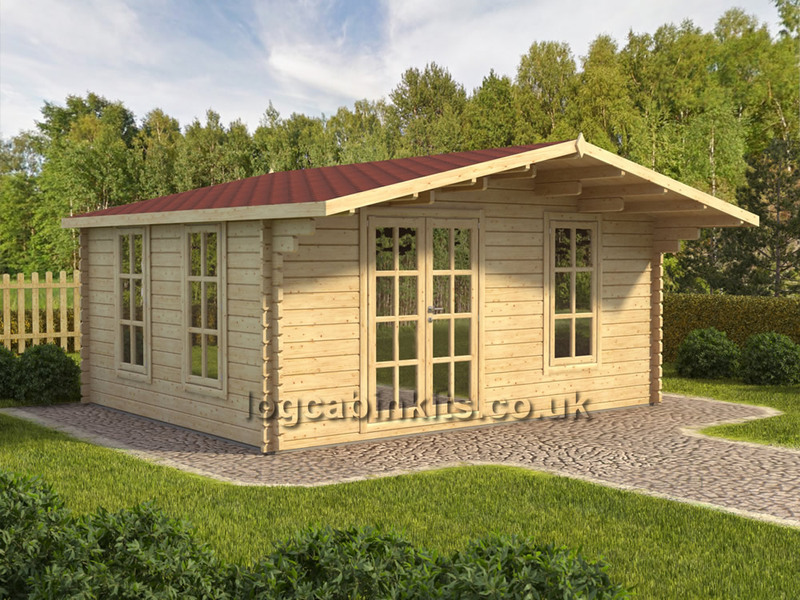 Cabins that are 3.0m deep (3x3 and 4x3) are furnished with one side window, all others have two. All glazing (doors and windows) is double glazed ensuring excellent insulation properties for the walls. For use throughout the year, it is strongly recommended to install insulation to the under floor and roof - with a little heating you will be ocmfy in most weather conditions the UK can throw at you ! Timber - All our cabins are manufactured from either Spruce or Russian Redwood, your cabin may be machined from either depending on what is available to the mill at point of production. If you have a preference, please advise. There maybe a delay in delivery if this is requested whilst we wait for the preferred timber to come through the production line. For full details of each model, please click on the size required.